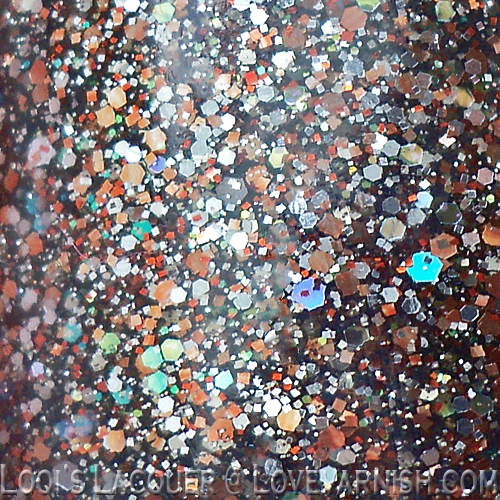 Deborah and I recently received a bunch of gorgeous Shimmer polishes to review! But instead of just showing you a big bunch of swatches all at once we decided we are going to show them separate with some nail-art and stuff thrown in, to spice it up! First up is Valerie, the youngest girl of the group. 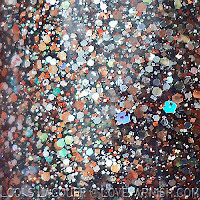 Valerie is a pretty mix of different sizes of copper and silver glitter in a brown, almost blackened base. There are also some holographic glitters in the mix, giving her a colourful sparkle. 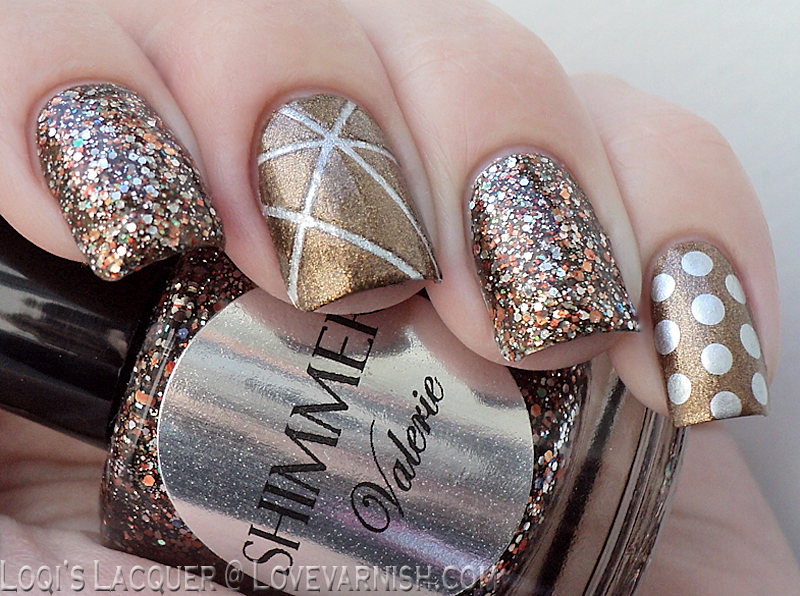 Valerie can be worn on its own in 3 coats and you don't have to dab a lot to get the glitter where you want. I however decided to layer 2 coats over Catrice - In the Bronx. Then I did some tape nail-art on my middle finger with In the Bronx over China Glaze Millennium and I added some dots on my pinky with the same colours. Valerie is kind of topcoat hungry, so I applied 2 coats to finish everything off. I'm really happy with how this manicure turned out. I love the combination of the bronze and silver in this polish! I hope you guys like it too, and see you next week! 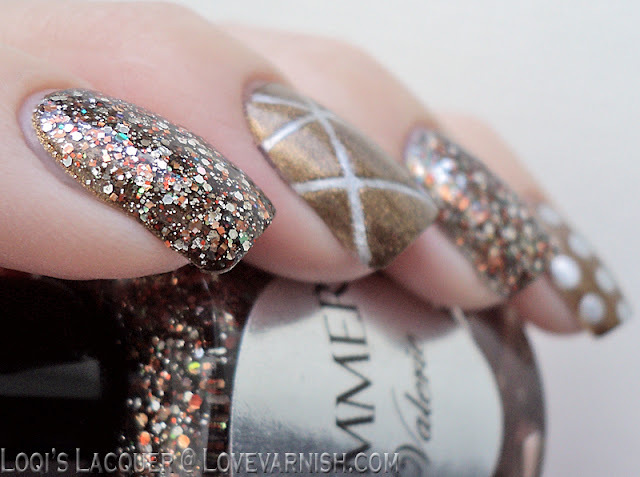 Gorgeous glitter and the nail art goes perfectly! 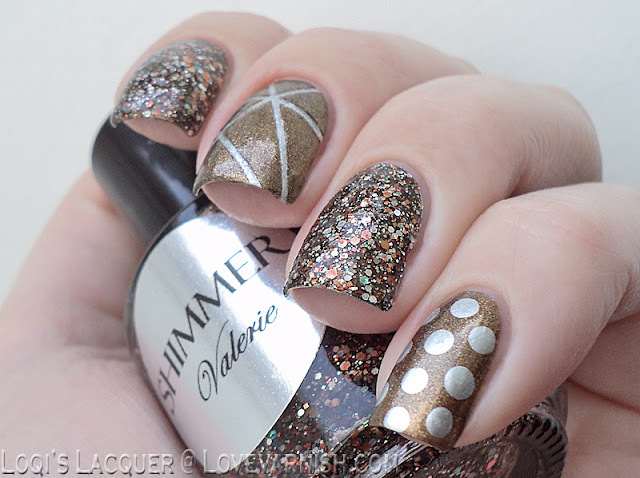 Valerie is such a pretty glitter! Great combo dear! I like ♥.